The Great Horned Owl Loop is in the Southern Area of the Sonoran Preserve in Phoenix, Arizona. The loop begins at the end of the Valle Verde trail where it makes a big loop around Union Peak. The first part of the loop has a few stretches that are pretty steep and a little rocky but the trail quickly moderates afterwards and although it still has lots of ups and downs they are much easier in comparison. Those that would like to avoid the steepest part of the loop can substitute in the Cactus Wren trail which is relatively flat. The Desert Vista trailhead is located at 1900 West Desert Vista Trail. There are restrooms and water available at the trailhead. The Great Horned Owl Loop begins about 2 miles from the trailhead via the Desert Tortoise trail at the end of the Valle Verde trail. A glance at the top of the trail marker shows the fluctuations in the elevation profile for the Great Horned Owl Loop and as you can see it is far from flat. The trail starts off climbing right from the start as the loop heads toward the east side of Union Peak. There are a few spots like this that are steep and rocky. On the bright side they aren't very long. As the trail levels off and travels around the east side of the mountain the Union Peak trail branches off on the right at the half mile point. A trip up to the Union Peak trail will add about 0.8 miles to the total round trip distance. A little past the Union Peak junction the trail gets a lot easier and begins descending down into the valley below. At the 1 mile point from where the loop began the Cactus Wren trail connects on the left. 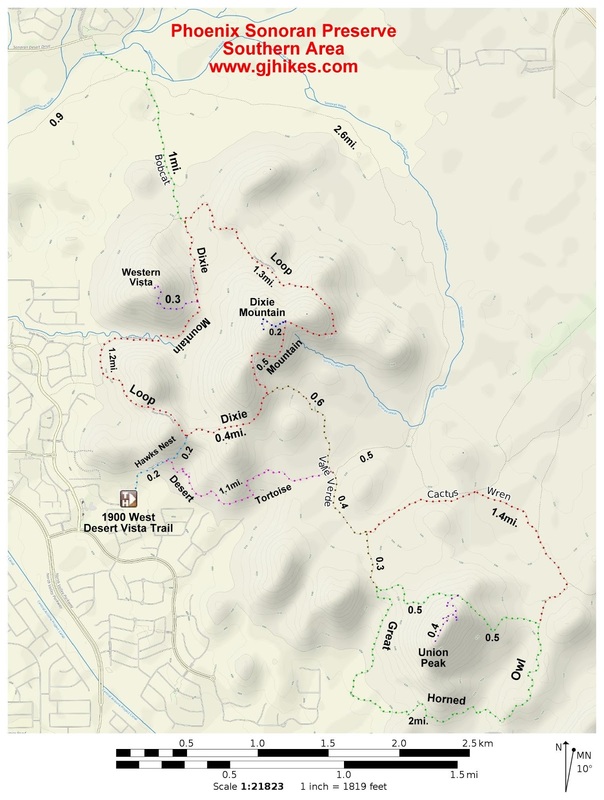 Those that take advantage of the Cactus Wren trail to avoid the climb around the east side of Union Peak would join the Great Horned Owl Loop at this point. From the Cactus Wren junction the loop begins wrapping around the south side of the mountain. The trail dips in and out of several shallow washes as it follows the contours of the drainage. 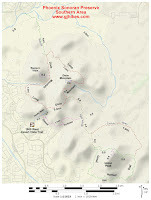 As the trail begins looping around the west side of the mountain it passes several spurs that connect it with the local neighborhoods. After a moderate climb the trail finds its way back up to where the loop first began at the end of the Valle Verde trail. From here it is 2 miles back to the trailhead via the Desert Tortoise trail and 2.1 miles by way of the Valle Verde and Dixie Mountain Loop trails. The map can come in handy for planning even longer excursions. On the day that we were taking the photos for this post we saw a mix of both hikers and mountain bikers that were making use of the Great Horned Owl Loop. All of the hills make it a good place to get a workout while enjoying the desert scenery of the Sonoran Preserve. If you would like to see it for yourself then all you have to do is grab your bike or 'Take a hike'.